As a farce, L’Amour médecin was written in prose and contains three acts. Farces allow some physical comedy. 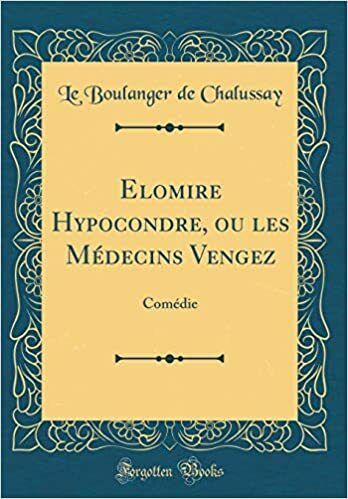 As a comedy of manners, it is Molière’s second satire on medicine, the first is Le Médecin volant (The Flying Doctor), written in 1645 and played in 1659. The third and fourth are Le Médecin malgré lui (1666) and Le Malade imaginaire imaginaire (1673). L’Amour médecin is rooted in Le Médecin volant, in Charles Sorel’s Olynthie, a short story, and in earlier farces. L’Amour médecin was first performed at Versailles on 15 September 1665. Molière’s troupe was la troupe du Roi and Louis was demanding. L’Amour médecin was written, and roles learned and rehearsed, in five days. After it premièred at Versailles, L’Amour médecin was performed at the théâtre du Palais-Royal, la troupe du Roi‘s main venue. In L’Amour médecin, the role of Sganarelle, created in Le Médecin volant, is that of heavy father. 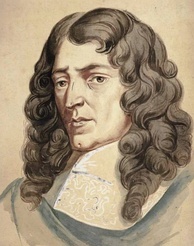 Sganarelle was played by Molière during Molière’s life time. In Dom Juan, he is a valet. At any rate, L’Amour médecin was a very successful comedy and, despite a cast of several doctors, the plot was simple, a characteristic of Molière’s plays. In L’Amour médecin, Lucinde is feigning illness, but her father believes she is very sick. Neighbours and relatives have their opinion to give. Monsieur Guillaume, who sells tapestries, thinks a tapestry showing a forest should adorn her room. 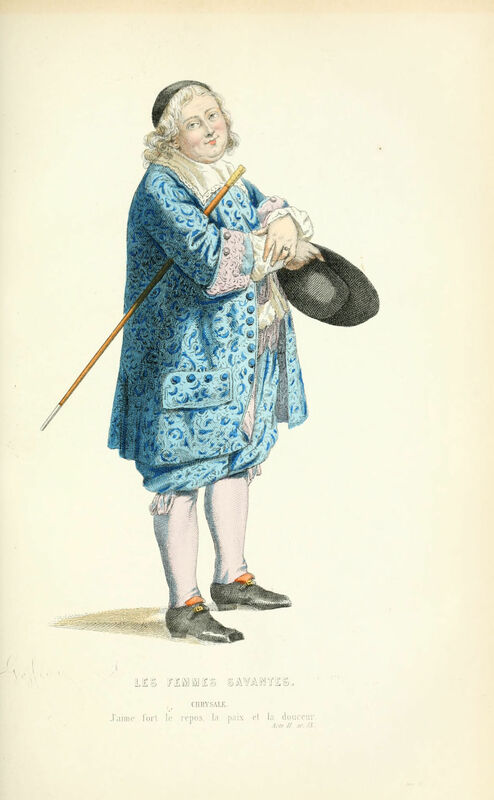 Monsieur Josse thinks the gift of “finery and fancy dress,” as well as jewels may save Lucinde’s life. Aminte believes that Lucinde should marry, but Lucrèce objects. Pregnancies would kill Lucinde, given her humeur, the four temperaments. Et moi, je tiens que votre fille n’est point du tout propre pour le mariage. Elle est d’une complexion [humeur] trop délicate et trop peu saine, et c’est la vouloir envoyer bientôt en l’autre monde, que de l’exposer comme elle est à faire des enfants. Le monde n’est point du tout son fait, et je vous conseille de la mettre dans un couvent, où elle trouvera des divertissements qui seront mieux de son humeur. Sganarelle feels that, the remedies they propose show that his niece, neighbours and friends have something to gain by following Sganarelle’s advice. He uses the word intéressé. Sganarelle dismisses them all saying that his plan is to keep his daughter. He and Lucinde have a conversation. Aimerais-tu quelqu’un et souhaiterais-tu d’être mariée? In 17th-century France and in Molière’s comedies, jealousy transforms a lover’s discourse into imprecations that alienate a young woman, the ingénue. Incestual love is out of the question. Sganarelle loves his daughter as fathers do. So, let us suggest a twist on the reversal all comedies feature. Comedies promotes the marriage of the young lovers. Le blondin berne le barbon. (The young man fools the old man.) In L’Amour médecin, the young man is Clitandre. Lucinde has not told Lisette about Clitandre, which may reveal hopelessness. In comedy, maids, servants, valets, and, at times, siblings are the brilliant minds who ensure that a young woman is not handed over to a man she does not love. I re-read a few chapters (préciosité) of one of Georges Mongrédien’s books on the 17th century in France. According to Mongrédien, Molière did not oppose préciosité, despite his Précieuses ridicules. These were affected ladies whom he simply humiliated. Although comedy is rooted in ancient fertility riduals, Molière, does not allow young women to be forced into marrying men they find repulsive. At that time in history, women often died in childbirth or were pregnant year after year, which could lead to a premature death. However, we are alive. So, many women have survived pregnancies and many, if not most have never been subjected to yearly pregnancies. In short, L’Amour médecin is comedy as usual, which the title of the play suggests. In fact, L’Amour médecin is Molière’s only comedy the contents of which are revealed in the title. Lucinde wishes to live a normal life and, for many women, life has long been considered improbable without the company of a man. L’honnête homme was born in the salons and salons also shaped galanterie. Mademoiselle de Scudéry‘s Carte de Tendre is a product of the salons. However, although our pater familias is the alazṓn of Greek old comedy, he wishes to keep his daughterfor himself, which is absurd. A-t-on jamais rien vu de plus tyrannique que cette coutume où l’on veut assujettir les pères? Rien de plus impertinent, et de plus ridicule, que d’amasser du bien avec de grands travaux, et élever une fille avec beaucoup de soin et de tendresse, pour se dépouiller de l’un et de l’autre entre les mains d’un homme qui ne nous touche de rien? Non, non, je me moque de cet usage, et je veux garder mon bien et ma fille pour moi. In Act 2, Lisette fumes when she hears that Sganarelle is calling in a team of doctors. Ma foi, Monsieur, notre chat est réchappé depuis peu, d’un saut qu’il fit du haut de la maison dans la rue, et il fut trois jours sans manger, et sans pouvoir remuer ni pied ni patte; mais il est bien heureux de ce qu’il n’y a point de chats médecins: car ses affaires étaient faites, et ils n’auraient pas manqué de le purger, et de le saigner. Il vaut mieux mourir selon les règles, que de réchapper [to recover] contre les règles. During Act 2, the doctors disagree. So, at the beginning of Act 3, they reflect upon their quarrel and conclude that they are endangering their profession. They could not cure, not in the 17th century, but human beings who fell ill consulted and this is how doctors made a comfortable living. So, to a large extent, doctors preyed on vulnerable human beings and thus constituted a group of impostors, a dramatist’s target. They worked for the money. Je n’en parle pas pour mon intérêt. Car, Dieu merci, j’ai déjà établi mes petites affaires. Qu’il vente, qu’il pleuve, qu’il grêle, ceux qui sont morts sont morts, et j’ai de quoi me passer des vivants. Mais enfin, toutes ces disputes ne valent rien pour la médecine. Yet, a new doctor is introduced. Lisette and Clitandre have organized a stratagem. Clitandre will make believe he is a doctor and he will be a doctor who has already cured Lucinde. Lisette introduces him and Sganarelle notices that there is not much beard to this doctor. Clitandre tells Sganarelle that he treats both the mind and the body. He has succeeded in curing Lucinde by learning that she wanted to marry. What a silly thought! Sganarelle agrees. A very astute Clitandre takes Sganarelle’s pulse and tells him that his daughter is very sick. Sganarelle is surprised, but Clitandre explains that there is sympathy between a father and a daughter. Sg. Vous connaissez cela ici? Cl. 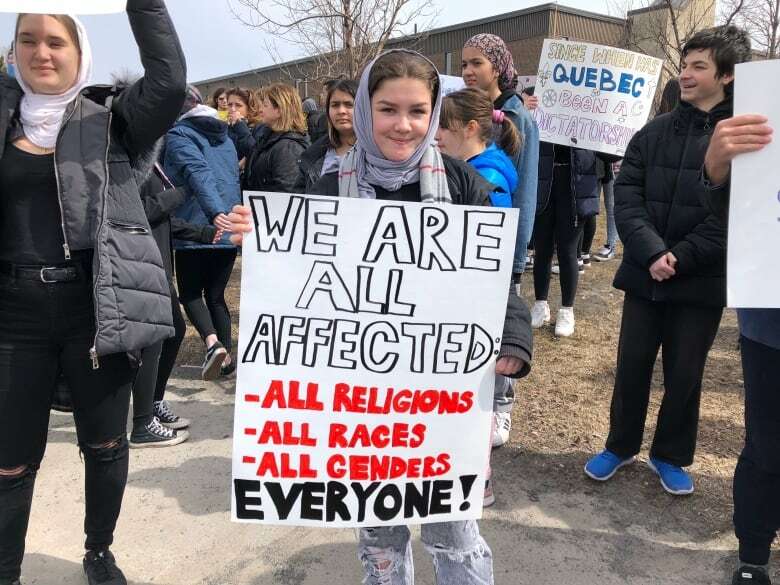 Oui, par la sympathie qu’il y a entre le père et la fille. The plan is to make Lucinde believe she is getting married. As you know, in Molière, one plays along with a patient’s fancy, which is what Toinette and Béralde will do in Le Malade imaginaire (The Imaginary Invalid), to help the young lovers and Argan. She will enable Clitandre to speak with Lucinde, Lisette tells Sganarelle that Clitandre must speak to his patient alone. The cure is a marriage. It will not be a real marriage, in Sganarelle’s eyes, but he will be made to sign the documents, as will Lucinde. Clitandre has arrived, ring in hand and a notary waiting outside. Sganarelle is going: “folle, folle, folle” as he himself marries off his daughter, endowing her generously. The spectator can hear Lisette’s “un mari, un mari, un mari.” L’Amour médecin is a comédie-ballet so Clitandre invites Sganarelle to be entertained. Sganarelle has been fooled into allowing his daughter to marry. Illusion was reality. A play rescued Lucinde. Sg. Voilà une plaisante façon de guérir. Où est donc ma fille et le médecin? Li. Ils sont allés achever le reste du mariage. [Sg. Here’s a pleasant way of curing! Where are the doctor and my daughter? Among friends and colleagues, La Mothe Le Vayer, in particular, Molière accepted that nature was both good and bad, but that it couldn’t be changed. La Mothe le Vayer wrote a letter defending Molière’s Tartuffe. In 17th-century France, La Rochefoucauld is associated with the discourse on self-interest (intérêt). Georges Mongrédien, La Vie littéraire au XVIIe Siècle (Paris : Taillandier, 1956), pp. 187-253.